So, what environment does one fly in? Google Street View? https://thedroneracingleague.com/simulator/ is one of the more modern sims. By the way. Do you know any RC flight simulator that runs under Linux? FPV Freerider would be an option. Only the version on itch.io though, the Steam release is Windows only for some reason. 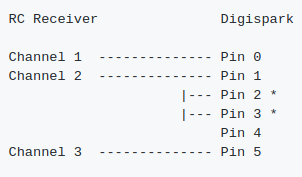 The newest version of BetaFlight (The firmware most racing drone pilots uses) also has this feature in current release where your receiver connected to the flight controller connected to PC USB port will act as wireless SIM controller and you can use your TX binded to RX to use simulators. Basically it exploits STM32 chips to act as USB HID. To save those with older FCBs a trip: It only works with F4 and up. Nice idea though. Does anyone have a simple solution to do the exact opposite? I’d like to output a PC into an RC controller trainer port, allowing the use of a flight stick to fly an RC plane. Since JR/Spektrum/FrSky radios all use a TRS plug for trainer, this outputs PPM data using your PC’s headphone jack. No special hardware required. If you’re willing to go smarter, Ardupilot is a flight control software that runs on a handful of different flight controllers, has control for just about any type of air, land, or seacraft you desire, and most ground control software can read USB gamepads, and send control over a MAVlink telemetry protocol using an ISM band modem. This does, however, come with some noticeable control latency.